HEGYESHALOM, HUNGARY/VIENNA – Thousands of exhausted migrants streamed into Austria on Saturday, bussed to the border by a Hungarian government that gave up trying to stop them as Europe’s asylum system buckled under pressure from the sheer numbers reaching its frontiers. After days of confrontation and chaos, Hungary’s right-wing government deployed dozens of buses to take migrants from Budapest and pick up over 1,000 others – many of them refugees from the Syrian war – who had set off doggedly by foot on Friday down the main highway to Vienna. Bavarian state police said they expected the first refugees to arrive in Germany around midday (1000 GMT), with national rail operator Deutsche Bahn saying a special train with 500 refugees aboard due to reach Munich around lunchtime. Hungary, the main entry point into Europe’s borderless Schengen zone for migrants surging northwards through the Balkans, has taken a hard line, vowing to seal its southern frontier within days. Hungarian officials have also painted the crisis as a defense of Europe’s prosperity, identity and “Christian values” against an influx of mainly Muslim migrants. For days, several thousand camped outside Budapest’s main railway station, where trains to western Europe were canceled as the government insisted all those entering Hungary be registered and their asylum applications processed in the country as per EU rules. Citing traffic safety, Hungary said it would supply some 100 buses to take them to the Austrian border. But the move marked an admission that the government had lost control in the face of large numbers determined to reach the wealthier nations of northern and western Europe at the end of an often perilous journey from war and poverty in the Middle East, Africa and Asia. By Saturday morning, Austrian police said 4,000 had arrived at the border, and that numbers might more than double during the day as buses queued on the Hungarian side. 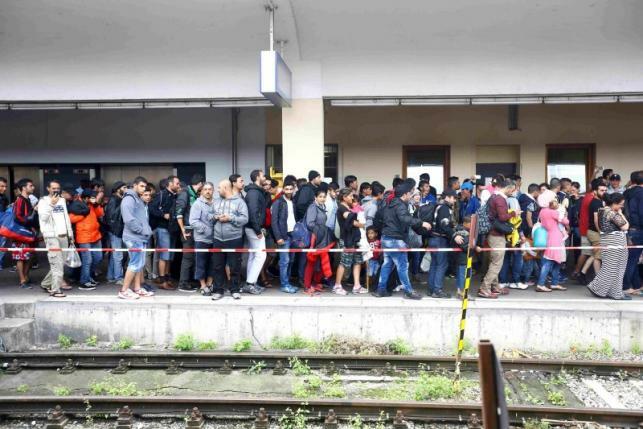 Austria laid on extra trains and shuttle buses to ferry the migrants from the border town of Nickelsdorf to Vienna. Men, women and children poured out of the train, saying they were resolved to continue on to Germany, and were handed food, drink and other supplies on a fenced-off platform. “It was just such a horrible situation in Hungary,” said Omar, who was traveling with his family. “Because of today’s emergency situation on the Hungarian border, Austria and Germany agree in this case to a continuation of the refugees’ journey into their countries,” Austrian Chancellor Werner Faymann said on his Facebook page late on Friday. The scenes were emblematic of a crisis that has left the 28-nation European Union groping for solutions, and for unity. Pressure to take effective action rose sharply this week after pictures flashed around the world of the body of a 3-year-old Syrian Kurdish boy washed up on a Turkish resort beach, personalizing the collective tragedy of the refugees. Aylan Kurdi had drowned along with his mother and brother while trying to cross by boat on a tiny rubber dinghy to a Greek island. “Obviously it’s in everybody’s interest not to have the same situation emerging again; that’s why everybody in Europe should think twice about what they say and do,” Hungarian government spokesman Zoltan Kovacs said at the border. “If this is repeated day after day, this part of Europe will be crippled,” he told Reuters. The flow of migrants risking rickety boats to cross the Mediterranean or baton-wielding police on Balkan borders shows no sign of abating despite more trips by sea ending in disaster. On Friday about 30-40 people drowned off the coast of Libya after a dinghy carrying 120-140 Somalis, Sudanese and Nigerians deflated, causing panic on board, the International Organization for Migration said. A record 50,000 hit Greek shores in July alone and were ferried from inundated islands to the mainland by a government already floundering in financial crisis and keen to whisk them north into Macedonia, whence they enter Serbia and then Hungary. More than 140,000 migrants have been recorded crossing into Hungary so far this year from Serbia. On Thursday, over 5,000 crossed into Macedonia. Countless others may have entered without registering. By nightfall on Friday, the Keleti railway terminus in Budapest, for days a makeshift migrant campsite, was almost empty as smiling families boarded a huge queue of buses that snaked out of the capital. They left shoes, clothes and mattresses scattered behind them. Helicopters circled overhead.